Scientists developed a computer model to identify four possible instances of true polar wander in the past. And, they say, true polar wander is happening now. Scientists based in Germany and Norway today published new results about a geophysical theory known as true polar wander. That is a drifting of Earth’s solid exterior – an actual change in latitude for some land masses – relative to our planet’s rotation axis. These scientists used hotspots in Earth’s mantle as part of a computer model, which they say is accurate for the past 120 million years, to identify four possible instances of true polar wander in the past. And, they say, true polar wander is happening now. These scientists published their results in the Journal for Geophysical Research today (October 1, 2012). The scientists – including Pavel V. Doubrovine and Trond H. Torsvik of the University of Oslo, and Bernhard Steinberger of the Helmholtz Center in Potsdam, Germany – established what they believe is a stable reference frame for tracking true polar wander. Based on this reference frame, they say that twice – from 90 to 40 million years ago – the solid Earth traveled back and forth by nearly 9 degrees with respect to our planet’s axis of rotation. What’s more, for the past 40 million years, the Earth’s solid outer layers have been slowly rotating at a rate of 0.2 degrees every million years, according to these scientists. Diagram showing solid-body rotation of the Earth with respect to a stationary spin axis due to true polar wander. This diagram is greatly exaggerated. According to Doubrovine and his team, Earth’s solid outer layers have been slowly rotating at a rate of 0.2 degrees every million years. Diagram via Wikimedia Commons. A geomagnetic reversal, or reversal of Earth’s magnetic field, known to have happened before in Earth history. Plate tectonics, which describes the large-scale motions of great land plates on Earth and is thought to be driven by the circulation of Earth’s mantle. 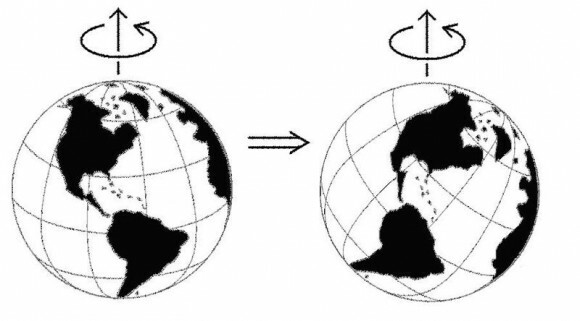 Precession of the Earth, whereby our world’s axis of rotation slowly moves, tracing out a circle among the stars, causing the identity of our North Star changes over time. If the volcanoes, land and other masses that exist within the spinning Earth ever became sufficiently imbalanced, the planet would tilt and rotate itself until this extra weight was relocated to a point along the equator. That’s the theory of true polar wander. It would cause a movement of Earth’s land masses, but for a different reason than the reason the continents drift in the theory of plate tectonics (formerly called “continental drift”). In the theory of plate tectonics, the continents drift because Earth’s the layer of Earth underlying our planet’s crust, called the mantle, is convective. That is, it circulates, slowly – like water about to boil. In true polar wander, on the other hand, a similar-seeming movement of land masses on Earth’s crust happens in order to correct an imbalance of weight with respect to Earth’s spin. Scientists’ understanding of true polar wander overlaps with their understanding of plate tectonics in various ways. That’s understandable, since it’s all the same Earth. Scientists delving into true polar wander want to know when, in which direction, and at what rate the Earth’s solid exterior might be rotating due to true polar wander. To sort it out, they say, you would need a stable frame of reference to which observations of relative motion might be compared. Doubrovine and his team say they found one: volcanic hotspots. Hotspot forming an island chain. As land plates drift, a successive of volcanoes form over the hotspot. Image via Wikimedia Commons. In geology, hotspots are volcanic regions fed by Earth’s underlying mantle. For example, the Hawaiian islands are believed to have formed over a hotspot in the mantle. The hotspot created a volcano, but then – as that land plate drifted over time, as described by the theory of plate tectonics – the volcano drifted, too, and was eventually cut off from the hotspot. Gradually, another volcano begins to form over the hotspot, right next to the first one. And then it moves on … and another one forms … and so on … and so on. Earth’s crust produces first one, then another volcano over the hotspot until a long chain of volcanoes forms, such as in Hawaii. Hotspots have long been used to understand the motion of tectonic plates. Doubrovine and colleagues went a step further in order to understand true polar wander. 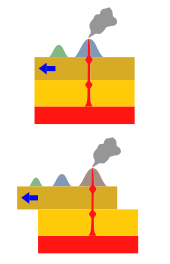 Instead of treating the hot spots as static – frozen in place at one spot above Earth’s mantle – their computer model let the hotspots’ positions drift slowly. According to these scientists, this drifting is what produced a model of a stable reference frame, which in turn let them draw conclusions about true polar wander. They say their model does a good job of matching observations of real hotspot tracks on Earth – the path drawn by each hotspot’s island chain – which gives them confidence their results about true polar wander are accurate. The Hawaiian islands are believed to have formed over a hotspot – a particularly hot place in Earth’s underlying mantle. Scientists expanded on previous thinking about hotspots to suggest that Earth’s solid surface is drifting, minutely, with respect to our planet’s rotation axis. Bottom line: German and Norwegian scientists have incorporated hotspots in Earth’s mantle into a computer model being used to study true polar wander. They say their work established a stable reference frame for this study that lets them conclude Earth is undergoing true polar wander today.